Stamped concrete can make a dramatic impression, and there are many reasons why Thornton homeowners and businesses are choosing stamped concrete installed by Metric Concrete. Stamped concrete will enhance their landscapes and buildings. From a cobblestone driveway to a slate and stone patio, the look of textured and colored concrete is not only realistic but also gives the permanent durability of concrete. Stamped Concrete is also cost-effective over alternative materials such as pavers, or natural stone. It can be colored, shaped, and designed to achieve almost any look imaginable. Metric Concrete & Design Inc. is the premier installer for stamped concrete in Thornton. From quite some time now, polished concrete floors have become undoubtedly the most popular and widely spread flooring option used for Thornton residential, commercial and industrial spaces. The growing popularity of stained and polished concrete floors in Thornton is mainly attributed to the lots of benefits polished concrete floors offer. Polished concrete floors have a higher durability and sustainability than any other flooring option. 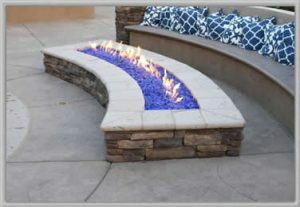 You can choose nearly any color, create patterns with saw cuts, or embed aggregates, glass, or interesting objects into the concrete prior to polishing. 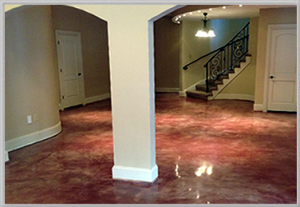 Stained and polished concrete is easy to clean and resistant to moisture. It permits no mold, mildew or allergens to accumulate on the surface. Contact Metric Concrete Construction & Design to learn more about the most professional stained and polished concrete flooring solutions in Thornton.